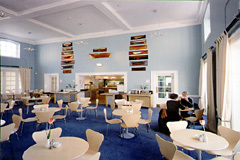 Situated adjacent to Greenwich Park, within The National Maritime Museum, The Regatta Café serves good, fresh, reasonably priced food cooked daily on the premises. Salads and hot food always available with seasonal vegetables along with a range of sandwiches, scones, brownies and flapjacks and afternoon tea. The café is available for private hire, day or evening, for parties up to 100 in an unusual and historical setting. No museum admittance necessary to visit the café. Open every day. Winter 10-4.30pm, Summer 10-5.30pm. All major credit cards accepted (not Diners). No service charge. Open all day for hot meals, salads, snacks and afternoon tea.